Pieper » Roger Perron Inc.
We have really been enjoying our new family room designed and built by you. It is a comfortable and congenial room which blends right in with the rest of our home. The room reflects your excellent design sense and outstanding quality of construction. We have been proudly entertaining family and friends in the new room. As we think back on the whole process with you and your team, we know you will be the person we call to do any other work for us. We could not have selected a more hectic time to start home construction. However, the new room, the property fencing and the driveway gates were done on time and on budget with a minimum of interruption to our busy personal schedules. Thank you for adding so much to the daily enjoyment of our lives. Your easy manner, high standards, and the fine quality of your work as well as that of everyone you bring to a job bode well for the future success of your company. 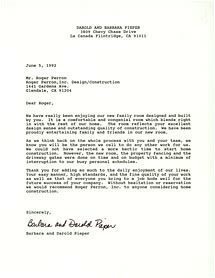 Without hesitation or reservation we would recommend Roger Perron, Inc., to anyone considering home construction.